The new airport is all set to put holes in the pockets of the travelers under UDF charges and roaring taxis that will clinch out few more hundreds, that’s the story now!! The infrastructure starving city is now getting hoaxed by this new ‘arrangement’ by and between few that would churn many closing the HAL airport…uhhhh! 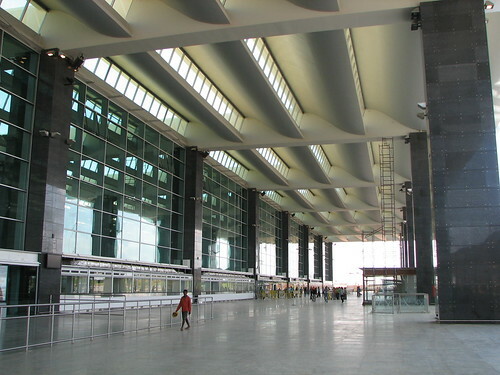 The new Bengaluru International Airport(BIA) – city’s dream project is the most discussed topic in the city at present. In metblogs there have been discussion with respect to updates, connectivity of the airport here, here and here. On sunday april 6th, the communications team of BIAL had conducted a visit to the airport for blogging communities. The event managed and hosted by Shane (PR team of BIAL). We were taken in a A/C bus from Chinnaswamy stadium. The actual plan was to travel by BMTC’s Vayu Vajra, but somehow it didn’t materialized. We took the usual NH-7 and approached the airport by switching from the highway using almost complete trumpet interchange. A 5 km ride from the interchange took us to the terminal building.